I’m a pretty big audio geek. Not a huge, gigantic, “I won’t buy speakers unless they’re blessed by the Dalai Lama” kind of audio geek, but I’m fairly particular about the audio quality coming from my speakers. It’s why I stayed away from MP3’s for so long – until I realized that the high bit rate versions reduce that high-frequency buzzsaw sound to within tolerable limits. So that’s why I’ve been staying away from the Bose Wave radios. I heard one a few years ago and it sounded like an 8″ speaker trapped in a little plastic box. Definitely had some extra bass but the treble and mid-range was bright and popped out to attack your ears. 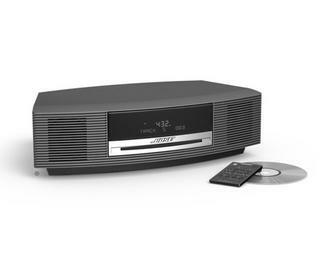 This version of the Bose Wave radio has an expanded waveguide which increases the bass response and reduces brightness. It actually sounds pretty darn good, especially at mid-to-high volumes. Sounds like a good speaker system, just with less width than you’d get from your home AV. It also plays MP3’s from CD, how cool is that for a clock radio? It won’t replace my home AV system any time soon, but I’m happy to throw out the $20 analog clock radio I bought from Walgreens about ten years ago.